stem rust Incidence, 2016 Survey, Kenya. 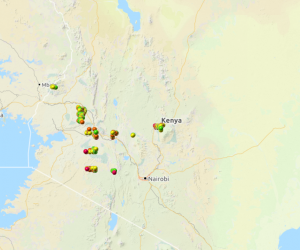 In 2016 surveys were carried out in all the four key wheat growing regions: South Rift (June, July), Mount Kenya region (July), and North Rift (September) and Central Rift (part of August and September). A total of 304 farms were sampled. Stem rust was detected in 235(78.3%), yellow rust in twenty-eight (9.3%) and leaf rust in fourteen (4.7%) of the farms. The disease severity was ranging from trace to 90S; trace to 60S and trace to 50S for stem rust, yellow rust and leaf rust respectively. Stem and yellow rusts were detected in all the wheat growing regions while leaf was detected in South, North and Central Rift. Stem rust infection ranged from TR to 90S with maximum infection in Central Rift( 88.3%), Mt. Kenya region (80.3%); South Rift(76.5%) and North Rift (72.4%). Yellow rust infection ranged TR to 60S with maximum infection in Central Rift (16.7%); North Rift(13.3 %) and minimum infection in South Rift( 4.9%),) and Mt. Kenya region ( 1.7%). Leaf rust infection ranged from trace to 50S with maximum infection in North Rift (10.2%) minimum infection in Central Rift (3.3 %) and South Rift (1.2%). Commonly grown varieties were : NjoroBw11, Robin, Kwale. Variety NjrBw11 was popular in North Rift (64.3%),Central Rift (38.3%) South Rift (23.5%). Robin was popular in Mt.Kenya region (49.2%), Central Rift( 25.0%), North Rift (23.5%) and South Rift (12.3%). Kwale was popular in South Rift(27.2%),Mt. Kenya region(16.4%) and Central Rift (10%) area under production of the sampled fields.Variety NjoroBw11 occupied the largest area in North Rift (64.3%) and Central Rift (38.3%). Variety Eagle was only popular in Central Rift (9.9)% area under production of the sampled fields. Fifty percent of the 8 previously released varieties are now susceptible to the Ug99 race. The general observation was that the area under Robin has decreased. Only those farmers who sprayed following the right recommendations harvested the crop. This applies to other other new varieties (K.Wren, K.Korongo and Hawk 12. Farmers who could not spray or sprayed without following the proper recommendations lost the crop to the disease Secondly, the disease pressure was very high in all the regions but the majority of the farmers sprayed to keep the inoculum load low (Central Rift, South Rift,North Rift, and Mt.Kenya region).